Why is it important that when we run our churches, we do so with God’s power and precepts leading us and not our ways or trends? Read Revelation 1: 17-20. What do you see in this passage that you can apply to your church today? Consider, what should be the essential framework to build your church into a healthier church? And then compare it to what are you doing now and what was done in the past? We are shown a plan. Christ, with His full mercy and grace, allows John to stand, gives him comfort, and gives him the important task of recording His precepts. We are shown Who and What our Living Lord is and does. Then we respond by living it out, preaching it out and follow-through it all out. Take a look at verse 19, it is interesting; it may set a tone for the meaning of Revelation, not necessarily literally, but as imageries that have a meaning for a purpose that is for us now and will still be so in its culmination. In the Upper Room, John reclined with Jesus for His last Supper and leaned on Him to show his devotion and love (John 13:32). Now, he falls at his feet. Jesus shows John His love by helping him stand. The lesson for us is we must understand the importance of reverence. We come before a holy God. He is not just a pal or friend or guide to dispense feel good sound bites; rather, He is our Savior and our Lord (2 Cor. 5:16). He has the keys in His hand; we have no need to fear our future when He is our Light, Guide, and Lord! This is Who we bow to, Who we proclaim, Who we teach about and inspire and equip our people too. “Fell at his feet” is an attitude and posture of great respect and awe. This can also mean the terror that was felt until the Angel touched and relieved them (Gen. 15:12; Deut. 3:2; Josh. 8:1; Jer. 1:8; Ezek. 1:28; 11:13; Dan. 8:18; 10:10; John 6:35; Rev. 4:10; 5:8; 7:11; 19:10; 22:8). 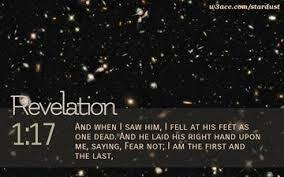 “I am the First and the Last” is the same as the Alpha and Omega in verse eight. Christ is eternal and fully God in all areas, attributes, power, character, and sovereignty (Isa. 44:6; 48:12; Rev. 2:8; 22:13). “Living One” refers to the resurrection and the triumphant Christ as the living God who gives us life, and then new life, renewal, and reason, and how He will renew the entire world. This is a contrast to paganism and the “gods” of wood and metal who are lifeless, careless, petty, and meaningless; our God is living and involved (Jos. 3:10; Psalm 42:2; 84:2; Isa. 41:4; 44:6; 48:12; Rev. 2:8; 5:9; 20:4-5; 22:1-2). “Keys of death and Hades” indicates that Christ is in absolute control over all domains and also points to His future role. Hades is the general realm of the dead; thus, Christ’s power is all encompassing. Keys were a symbol of power and influence. The one who held the keys was the authority and the one in control. It is very encouraging to those who are facing death to know that Christ is there and in control, and can open those gates at any time, including at the last days (Psalm 9:13; Isa. 22:21-22; Matt. 16:18; Acts 2:27-31; Rev. 20:14). “What is now and what will take place later” indicates past, present, and future, and refers to what is in Revelation references. It is for the present and future as well as rooted in the past, but not completed as of this writing. This can also refer to Revelation being divided into three parts: past in chapter 1:12-16, present in chapters 2-3, and future in chapters 4-22. However, each section contains content of all three “then, now, and later,” and does not necessarily refer to the entire structure of the Revelation (John 19:35). “The mystery,” this does not mean something not understandable or hidden; rather, it is something known to God that He reveals to us in His good time. We cannot guess what we do not know; however, Christ does know. Here, John plainly tells us the meaning, just as Jesus did with the parable of the sower (1 Cor. 2:7; 2 Thess. 2:7). “Angels,” meaning “messengers,” can mean people used by God to convey His message, such as pastors, or heavenly beings who live and work in Heaven. We are to realize our place and position to be holding on to Christ. The context seems to indicate the latter. Or, it can mean the significance of the churches in Heaven, that they are spiritual entities. This can also mean the prevailing characterization of the theme and “spirit” of each church or a “guardian angel.” In all practicality, it could refer to the seven different messengers John is sending with copies of his Epistle (Dan. 10:10-21; Matt. 18: 10; Luke 7:24; 9:52; Rev. 1:11; 10:1; 22:6). So what does this come down to? An indicator to see what is the condition of your church? Is He properly reverenced and referenced, taught about and honored, or is He just a self-help guide? Does Jesus control your church or do you or others think they do? How is your light shining before others? Our Light is Christ and we are called to show Him in our lives and in our Church! How can you do this better?